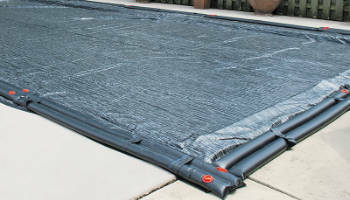 US Hardware Supply is proud to offer Yard Guard brand water bag pool covers, manufactured by HPI, at wholesale pricing. 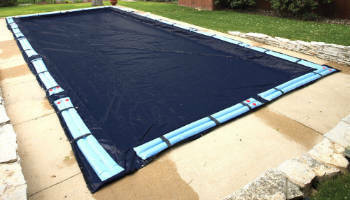 Our covers are durable, attractive and simple to install, making them the perfect solution for covering your in ground pool. 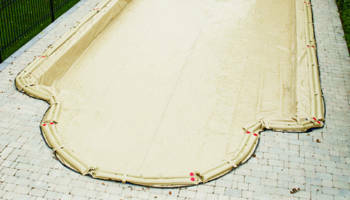 Water bag pool covers keep dirt and debris from your pool. 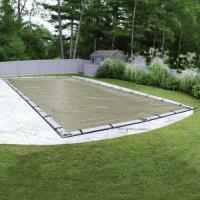 Using a pool cover on your in ground pool makes spring start-up easier by keeping last years leaves out. 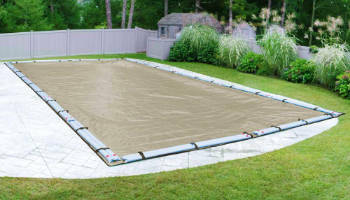 Your in ground pool is a source of enjoyment and also an investment that needs to be protected. Our knowledgeable staff is available to help you with any questions concerning your pool cover decision. Whether you are planning a new cover or replacing an existing cover, our job is to get you the right one at the best price for your application. 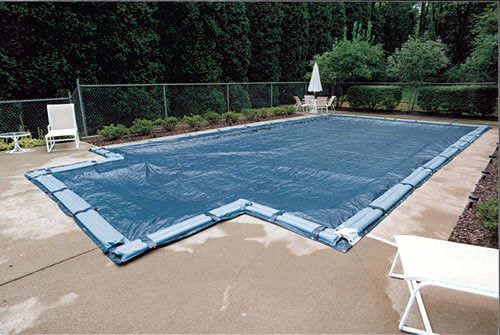 We stock various types of water bag pool covers, in common sizes and colors to meet your needs. 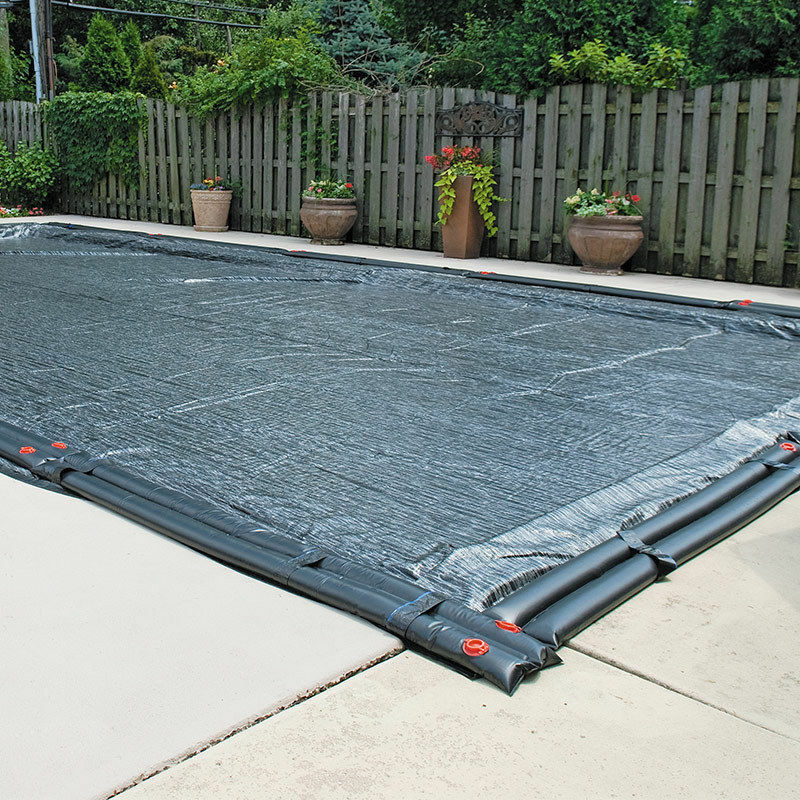 Incredibly strong ArmorKote winter cover provides your pool with extra tough winter protection for years to come. ArmorKote covers are 30% lighter and 50% stronger than other covers with a higher tear and puncture resistance and superior seam strength. 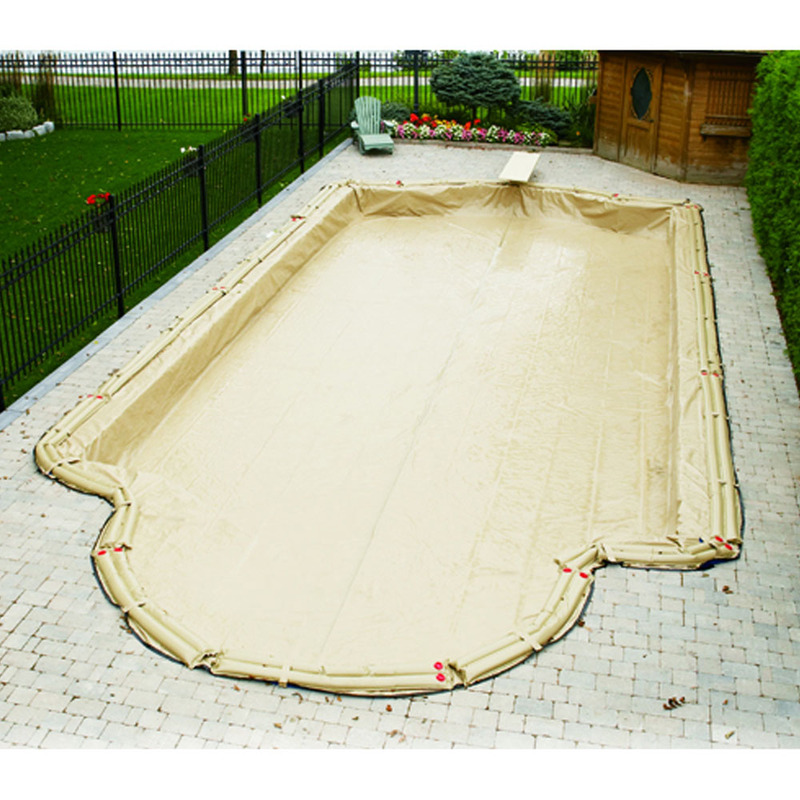 To retain it's beautiful appearance season after season, this tan cover is specially coated with a chemical resistand polymer to resist staining from chlorine. Plus the deep blue underside prohibits algae growth by not letting the light in that algae feeds on! This cover will stay grounded with it's heavy-duty water bag loops every 48 inches and corner loops for extra tie-down protection (matching tan water bags sold separately). A 5 or 6 foot overlap on in-ground pools, 20 year warranty / 5 year full. Water bags sold separately. Finished cover within inches of stated cover size. Water bag loops and tie down loops on in-grounds. All covers made in U.S.A.
In-grounds available in 5' and 6' overlaps. 20 Year Warranty - 5 Year full! Our knowledgable staff is available to help. 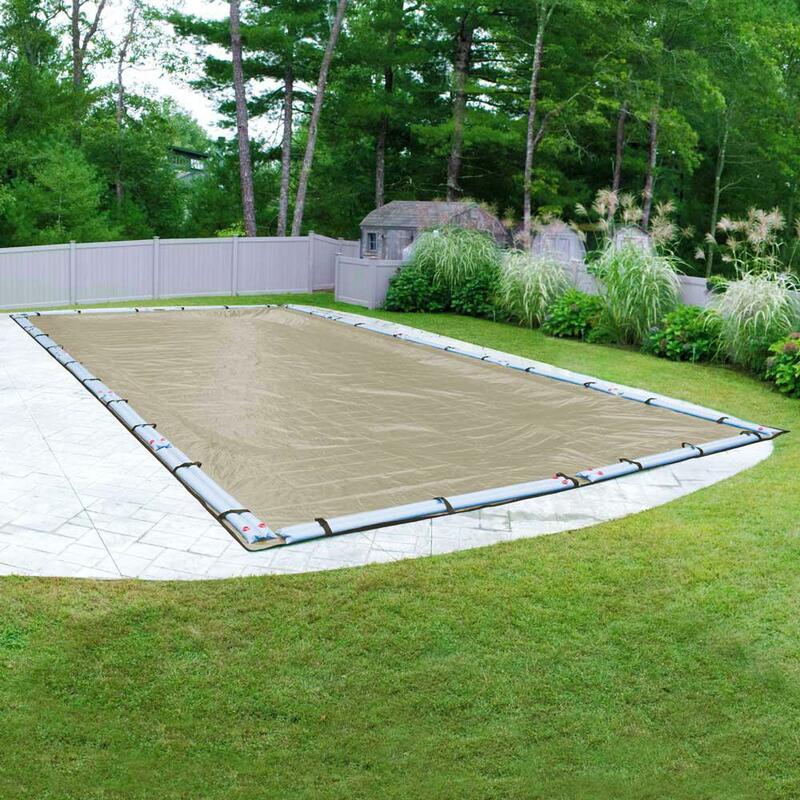 Enviro Cover is a patented reflective silver-coated mesh pool cover that speeds up the melting process, allowing water to filter through. This relieves pressure on pool walls and reduces the need for water where water is allocated or costly. Strongest mesh cover available. The Yard Guard patented lace coat construction fortifies and enhances the durability of the cover. 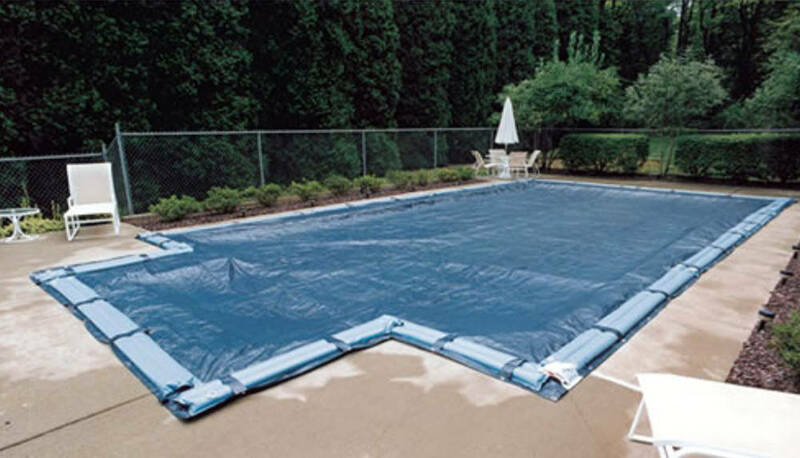 Eliminates the need to pump off water and avoids accidental spills when opening your pool in the spring. Reduces standing water, minimizing the effects of infectious insects. 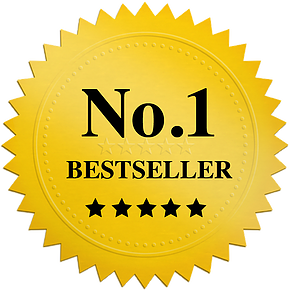 Uses a triple-edge binding on the perimeter of the cover to add strength and durability. Black coating to reduce algae growth. 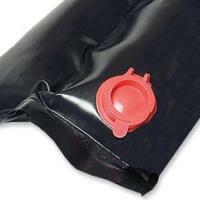 Inground covers are equipped with water bag loops. 8-year Warranty – one full year, balanced prorated. Enviro Cover is made by North Americans with North American material for North American winters. 8 Year Warranty - 1 Year full! 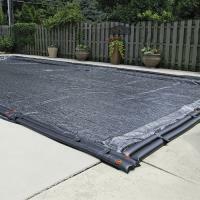 Incredibly strong ArmorKote winter cover provides your pool with extra tough winter protection for years to come. ArmorKote covers are 30% lighter and 50% stronger than other covers with a higher tear and puncture resistance.